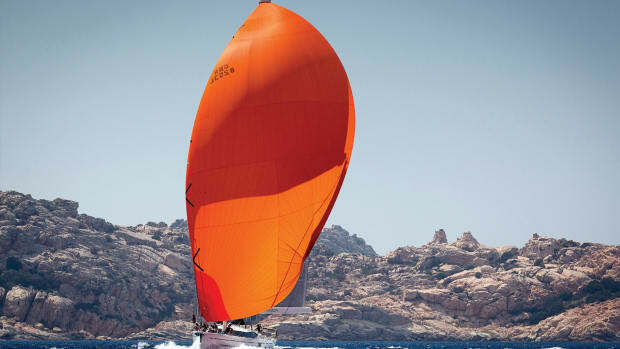 There has been a proliferation of new racer/cruisers in the 40-foot range. Some builders have returned to the genre after focusing on more cruising-oriented designs, but the Danish builder X-Yachts has been consistently turning out strong, stylish, comfortable performance boats for 25 years. 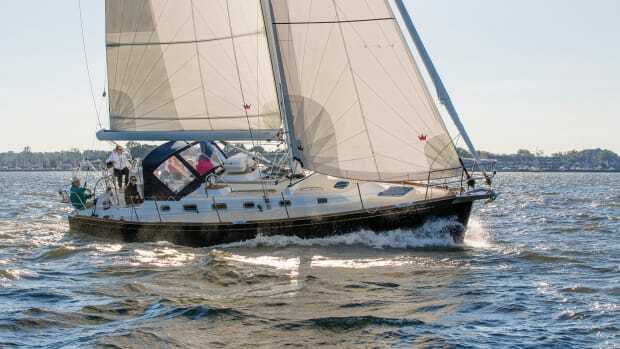 Drawing from this deep well of experience, Niels Jeppesen’s new X-43 was reported to have all the ingredients—excellent performance, comfortable accommodations, high-quality construction—that people look for in a racer/cruiser.  I joined the boat on a 300-mile delivery from Stamford, Connecticut, to Annapolis, Maryland, to find out if it lives up to the billing. It was cold and the sun had just popped above the horizon when we nosed out of Stamford Harbor under power. With no wind to speak of, we motored past the yacht clubs on Long Island Sound, down the East River past the New York skyline, and out the Verrazano Narrows. We averaged between 7 and 8 virtually noiseless knots under power, testimony to superior engine-room soundproofing. A building headwind was waiting for us as we reached open water. In 10 knots of apparent wind and flat water we were able to log 6 knots of boatspeed, and the helm felt the way I’d want my own boat’s helm to feel. The large wheel, Jeffa steering, and easily driven hull combined to produce fingertip control and superior responsiveness. The boat turned on a dime and tacked through 80 degrees. As we made our way down the New Jersey coast, the breeze built to a steady 25 knots with higher gusts. We tucked two reefs in the main, wound up several rolls of jib, sheeted the sails down tight, and prepared for a bumpy night of motorsailing. We came off some waves hard, and none of us got much sleep, but the boat performed well, given the circumstances. We didn’t break anything, and we were able to keep boatspeed up around 7 knots and to motorsail within 20 to 30 degrees of the eye of the wind. Once we rounded Cape May, our 12-hour windward slog turned into a power reach on the brown waters of Delaware Bay. After a celebratory cup of soup, we shook out the reefs and took turns playing with the boat. The breeze fell off a bit as we made our way up the bay, and even without a spinnaker (there was none on board) we recorded speeds in the 10s under full main and jib. I usually don’t lobby for steering duty while cruising, but I found myself hogging the helm. 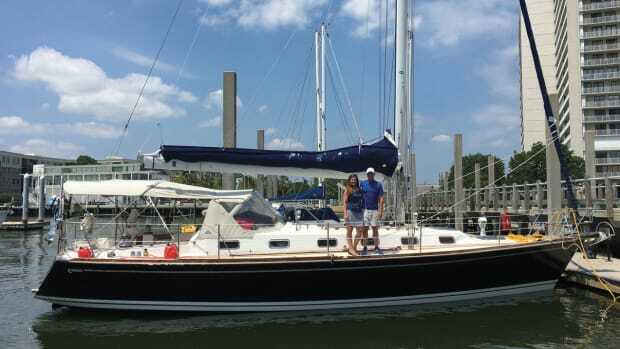 This boat was simply fun to sail. We charged up the bay, motored down the C&D Canal, and were calculating our ETA in Annapolis as we dropped a crewmember off at a fuel dock at the Chesapeake end of the canal and decided not to fuel up. 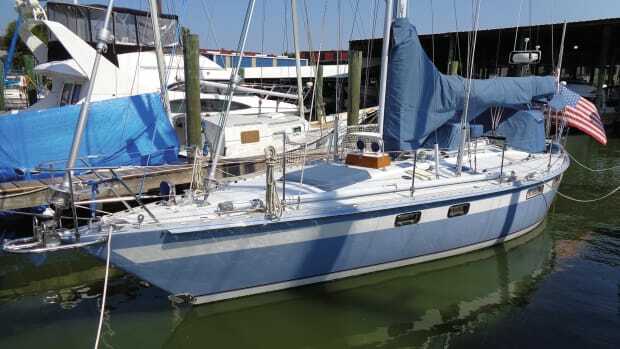 Murphy’s Law—we ran out of diesel and ended up sailing through the channel into the Chesapeake and down to Annapolis on a dying northwesterly. No problem. We were able to sail at around 6 knots in a faint breeze that would have stopped many other boats in their tracks. We were a little late getting in, but it was hard to fault the boat’s light-air performance. 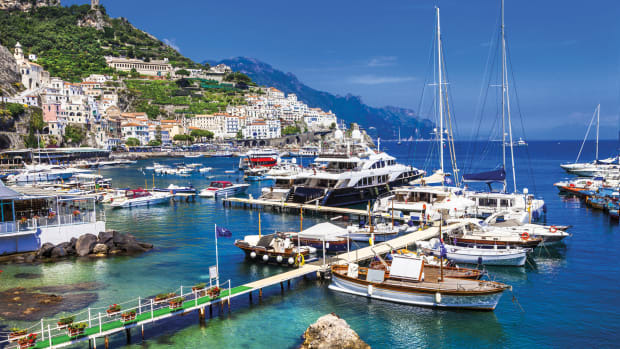 Spending a night or two on a boat in a wide variety of conditions can tell you a lot about the efficiency of the accommodations plan. I found it to be comfortable and well proportioned, equally suited to offshore work and dockside entertaining. As we motorsailed to windward, I made good use of the well-placed handholds and excellent footing on the boat’s synthetic teak-and-holly sole. When the boat heeled, I wedged myself comfortably into the nav station seat. The chart table is big enough to accommodate a full-sized chart book, the electronics installation is excellent, and there is plenty of space to mount an optional VHF, GPS, and even a radar screen. The Eurostyle galley that runs lengthwise along the port side of the saloon has considerable counter and stowage space. I may be culinarily challenged at home, but offshore I was able to cook our soup without too much difficulty. With one long, slightly curved seat and a smaller separate seat surrounding the dinette, the saloon is comfortable (though it has only one sea berth, which needs a lee cloth). Headroom in the main saloon is adequate at just over 6 feet. The master cabin forward has its own head, good stowage, a small sitting area, a large opening deck hatch, and a comfortable double bunk. The two mirror-image aft cabins have comfortable double berths, adequate locker space, and one small opening port each for ventilation. A four-cabin version is available. It is obvious that the Danes pay attention to the details of joinery. The interior is wrapped in a satin-varnished teak veneer that results in a warm "yacht" look and feel. Doors have stainless-steel hinges, lockers have strong, durable latches, and drawer fronts and the cabin sole are meticulously inlaid. The cockpit and decks are uncluttered and easy to navigate. The double-ended mainsheet runs below the deck from blocks near the mast on the boom back to winches close to the helmsman. The traveler runs directly in front of the steering pedestal. All lines from the mast run under the deck back to two banks of stoppers and coachroof-mounted winches. Cockpit seats are wide, deep, and topped with teak. Visibility from the helm station over the low-slung coachroof is excellent. 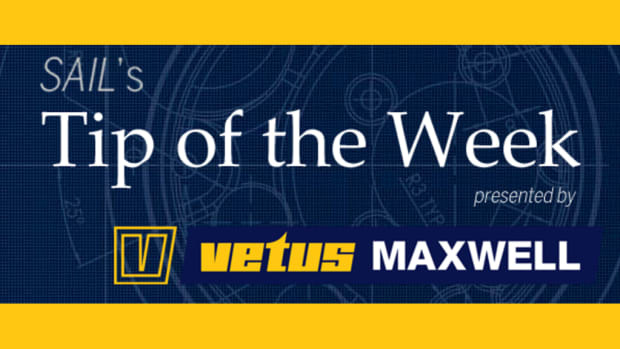 The big wheel allows the helmsman to sit comfortably on the coaming. The sidedecks are wide, and inboard shrouds make it easy to go forward. Stanchions are strong, the mooring cleats are bomb-proof, and the stainless-steel bow roller is sturdy enough to handle the demands of life on the hook. The standard spray dodger is easy to deploy and provides the requisite shelter when you’re bashing to windward; it stows in a recessed channel (with a zipper closure) on the cabintop when you want to get it out of the way. The only drawback was that the cabintop winch handles tended to foul the dodger when it came time to reef. 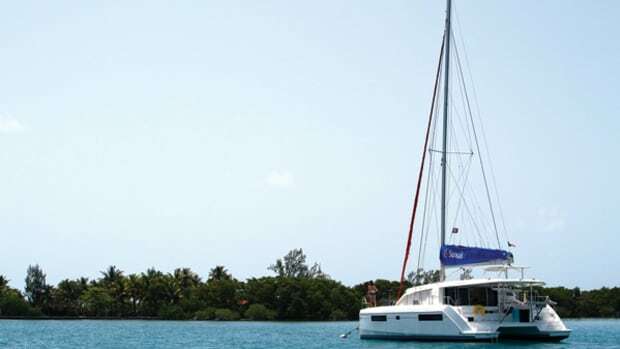 The sailing performance is excellent, the accommodations are functional, comfortable, and well finished, and the boat can bash to windward like a trooper. A more conservative cruising boat may be slightly more comfortable when you’re motorsailing into steep seas, but on any other point of sail the X-43 comes into its own. If you are in the market for a racer/cruiser (or a cruiser/racer), the X-43 deserves a good hard look. Hull and deck are built of biaxial E-glass and isophthalic polyester resin over a Divinycell core. 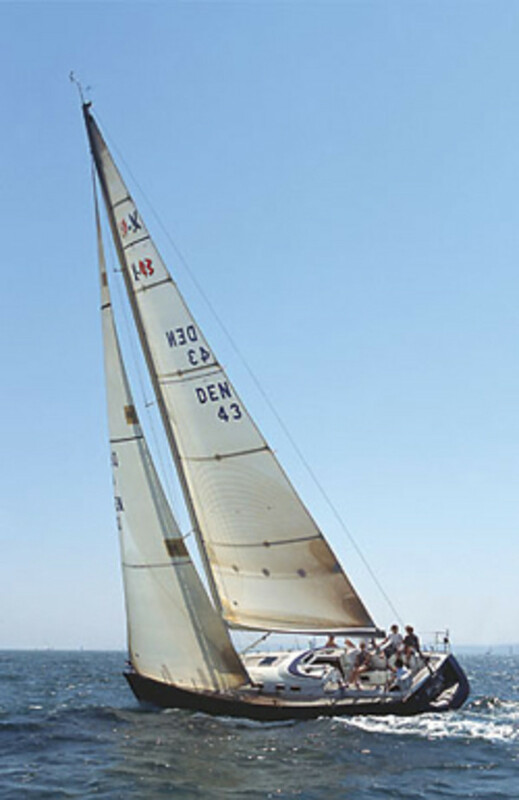 Solid laminate is used around the keel, rudder, and through-hull fittings. The hull grid centers around a steel I-beam that absorbs loads from the keel and rig and also provides a central hoist point. The rudderstock is solid aluminum. The rudder is built of resin and E-glass and has a Divinycell core.